The Steyr LP2 Compact is a high quality, PCP target pistol that is designed and constructed in Austria to the highest of quality standards. The whole pistol is hand built and carefully checked at every stage to make sure that nothing is incorrect, which ultimately gives you total confidence when it comes to taking your shot. The trigger runs on a ball bearing ensuring smooth, consistent working, and as the bearing is sealed no dust or dirt can enter, making it one of the most reliable systems currently available. The trigger is of Steyr own design, the first stage weight and travel, as well as the second stage and trigger stop position are all infinitely adjustable to customize this pistol to the individual. 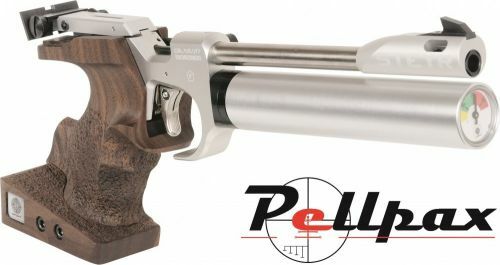 The pistol can dry fired with no extra tools or add ons required. The pistol will only fire once the bolt is completely closed for the up most of safety. The Rear and fore sight are also multi adjustable, with this UK import having the LP10 rear sight on, for maximum flexibility so you can always be on aim. The Rear sight can be opened up to a maximum of 6mm, and the length of sight can be changed from 268 to 298 mm to allow for even great flexibility. All of our Steyr products are official UK Imports and come complete in a plastic hard case to keep it safe at all times.